Your home’s plumbing and sewer system has most likely been a part of your house from the time it was built. Unless you live in a brand new home, your sewage system and drain piping could be very old. For older houses this means that there is a likelihood of a drain or sewage system line eventually experiencing some sort of issue. Do I need Sewer and Drain Leak Detection Services? If you are experiencing any of the following symptoms you should call us immediately for sewer and drain leak detection services. Do not hesitate, sewer and drain leaks can cause significant damage to your home or property. Normally, sewage system odor is usually blocked by water in the drain traps or by vents that only enable airflow in one direction (out of the structure). If water in the drain trap vaporizes, such as in an unused sink or bath, the sewage system odors are free to rise through the drain and into your home. If vent piping is not connected correctly or is damaged or deteriorating, the outdoor atmospheric pressure can push sewage system smells into your home. A simple sewer and drain leak detection appointment can diagnose issues like this quickly and cheaply. Sewage system lines back up due to obstructions. Blockages can include root intrusion, debris, grease buildup or a crushed piping. If your sewage system lateral is defective, it can be leaking water and waste into your backyard. As the dirt absorbs the extra moisture and nutrients, the growth of the surrounding area could substantially stand out in color and development rate. Exactly what is the cause of the break or leak? A break in your drain line can be cause by roots growing into it, animals caught inside of it, or a major clog that has backed up so badly it breaks the pipe. Every cause for the break in your drain line needs a different repair procedure and various preventative procedures for the future. Where is the break or leak? 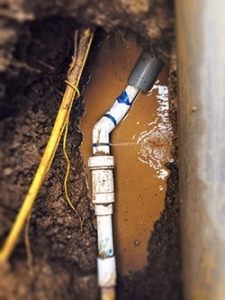 If the break or leakage in your drain line is outside your house, it is most likely far below the ground and will need excavation of the surrounding area to deal with. This adds considerable cost to your repair work. How pricey it will be will depend on a couple of things such as how deep you will be required to dig to get to the line, if you will have to break into pavement or concrete to do so, and how much restoring of the affected property will have to be done when the repair work is complete. How much damage is there to your property? If the break in your drain line has actually caused leaking and water damage to your house or foundation, or pooling of water or sewage somewhere on your property, these repair works will certainly contribute to the general expense of the repair work. The best preventative measure you can take is keeping your eyes open for leaks, water damage, or pooling water in your backyard. The quicker you catch any kind of line break, the less damage there is to repair. Will the city pay for repairs? If the damage is to your water or sewage system main you are only accountable for any damage to a certain point where the line attaches to the city’s primary lines. As soon as you figure out where the break in the line occurred, you could find that the city is in fact liable for the repair work. However, if the break has triggered any damage to your personal property, it is very difficult to petition the city to pay for that, so one once again, the faster you spot the better! If your sewage system or drain pipes are leaking into your property, you need sewer and drain leak detection services. Call Innovative Leak Detection now!